PD-50, a huge floating dry dock at the 82nd Repair Shipyard in Roslyakovo, Russia, accidentally sank on Oct. 29, 2018 while Admiral Kuznetsov, Russia’s only aircraft carrier, was inside for repairs. 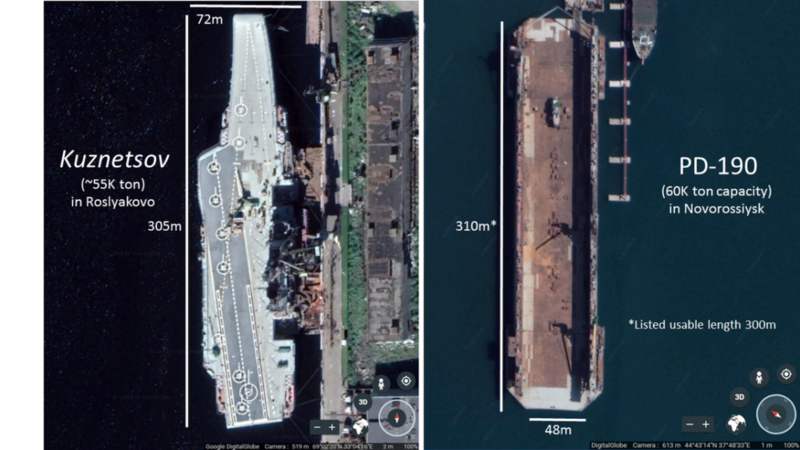 Kuznetsov is still afloat but the dry dock could be a total loss. While injuries and possible deaths in addition to damage to the flight deck — caused by a collapsing 70-ton crane — are noteworthy, the loss of the PD-50 could potentially ripple through the Russian navy and exacerbate its persistent problems with maintenance and modernization. Because of chronic problems with the production of new naval vessels larger than a frigate, Russia relies on large Soviet-era surface combatants to field a credible blue-water navy capable of projecting power and influence. Russian president Vladimir Putin recognizes the role a strong military can play in consolidating domestic support and strategic messaging abroad, and the Russian navy’s older capital ships remain one of Putin’s favorite instruments. By overhauling and extending the service life of existing, older ships, the Russian navy may be able to realize short-term cost savings compared to building new replacements. However, this approach only works as far as Russia can continue to modernize, renovate and rehabilitate these platforms. Even during the buildup of the “Gorshkov navy” during the 1970s, the Soviet predecessor to modern Russia proved capable of building impressive ships but did not invest in maintenance and repair. The under-investment in repair infrastructure is coming home to roost, and the potential loss of PD-50—bought from Sweden in 1980 and probably well past its service life—reflects this systemic problem. Russia has four possible options going forward, none of which are good. Cutting its losses on PD-50 and Kuznetsov. Raising and repairing PD-50. Using limited options in Russia to upgrade Kuznetsov. Or going outside Russia to third parties such as China. If Russia proceeds with its carrier modernization, all the available options entail delays and increased costs. There has been conflicting information about the extent, cost and progress of the Kuznetsov overhaul since it returned to Severomorsk in 2017 after its only combat deployment to Syria. Estimates about the cost of the Kuznetsovoverhaul have varied from 20 billion rubles, or $326 million, to 65 billion rubles or $1.14 billion. While there is dissonance about the details of possible upgrades to the ship’s anti-air and anti-ship missile systems, most sources agree Kuznetsov is getting a new powerplant, four new boilers, four retrofit boilers, repairs to the shafts and upgraded pumps, plumbing and arresting gear. Replacing or repairing Kuznetsov’s boilers, pipes, and turbines is not likely to be quick, easy, or inexpensive. The ship’s propulsion system was built in Ukraine three decades ago, and Kiev’s arms embargo on Russia after Moscow illegally seized Crimea in 2014 means replacing the carrier’s boilers and power generators requires Moscow to build replacement parts and machinery from scratch. A dry dock would almost assuredly be required to complete work on Kuznetsov and Russia may wish to cut its losses. Redirecting the resources to building new infrastructure and ships would be a more responsible use of finite resources than either repairing or replacing PD-50, as well as continuing Kuznetsov’s modernization. Moscow will have to examine the political and financial ramifications of indefinitely postponing Kuznetsov’s overhaul to determine if the modernization of a questionably useful platform is really worth the cost. There are significant challenges to raising and repairing the PD-50. Early reports indicate that PD-50 may be lying on its side in 160 feet of water, which would make the recovery technically difficult. If the PD-50 dock can be raised from its watery grave, a course of action that the director of the 82nd Repair Shipyard, Aleksey Rakhmanov, has addressed with skepticism, repairing it could take years at great expense. Winter is coming and it is unlikely that salvage crews will be able to make significant headway before the weather precludes salvage operations this season. 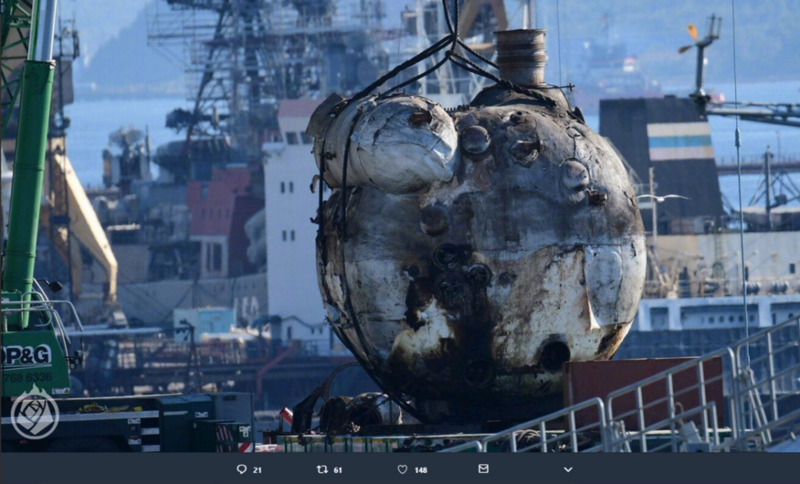 Even if the Russian navy is able raise the PD-50 at some point in the future, it still faces significant technical difficulties in repairing the electrical, mechanical and hydraulic systems, in addition to any physical damage to the structure from this mishap. Sweden’s subscription to the European Union’s post-Crimea sanctions regime, means Stockholm likely will not be amenable to assisting with the rehabilitation of the dock. This would leave Russian shipyard workers on their own to fabricate replacement parts and repair damaged, corroded and waterlogged systems that had been neglected for decades. There could be legal and jurisdictional challenges to raising and repairing PD-50, as well. 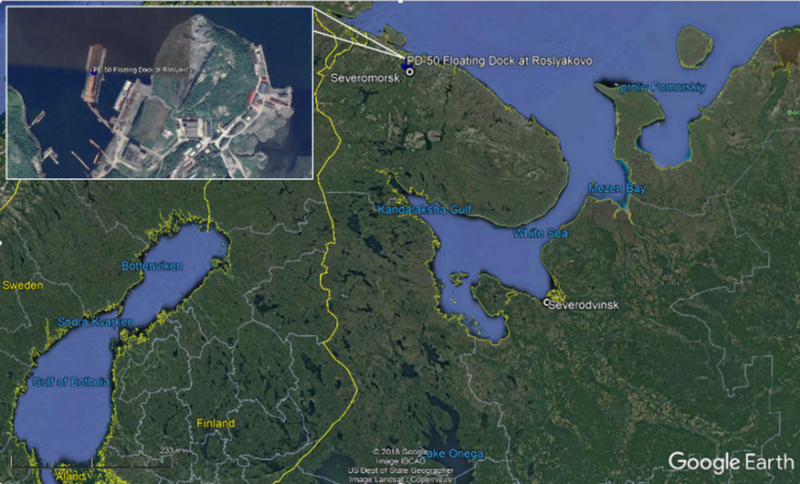 Partly state-owned Russian oil company Rosneft acquired the Roslyakovo facility in 2015 with the intention of turning the yard into a base for its offshore Arctic oil operations. Loss of the dry dock could affect icebreaker and oil infrastructure repair in the future as Rosneft and the Russian navy wrangle over responsibility for the accident, repair costs and priorities. Russia may have one other floating dry dock that is large enough to accommodate Kuznetsov, the PD-41 in Fokino, a small port near Vladivostok. The dock was built by Japan during the 1980s and may still be a viable option, reportedly accommodating work on the decommissioned Kirov-class Admiral Lazarev in 2014. However, either moving the PD-41 to Severomorsk, or towing the Kuznetsov to Fokino along with the necessary heavy equipment, workers and materiel would be geographically challenging and time-consuming. In addition to PD-41, Russia is in the process of building a massive dry dock at Zvezda Shipyard in Bolshoi Kamen. In September 2018, Rosneft CEO Igor Sechin claimed the facility is set to open as early as 2020, three years ahead of schedule. Delaying the repairs on Kuznetsov until the new facility opens in a couple of years is an option, but would require the carrier to be towed at least 6,000 nautical miles through challenging waters in the Russian northern passage, assuming it is navigable long enough to make the months’ long transit. Alternative routes could be more logistically challenging. Another option that has been proposed in the press is the PD-190 floating dock in Novorossiysk on the Black Sea, but it is questionable whether Kuznetsov would fit. The aircraft carrier might be able to fit in the dock, and with a 60,000-ton capacity PD-190 could lift the ship out of the water. However, the flight deck would overhang the dock on both sides, probably precluding the use of the floating dry dock’s cranes. In addition, there would be little margin for error and serious concerns about the stability of an asymmetric, top-heavy ship in an undersized dock. 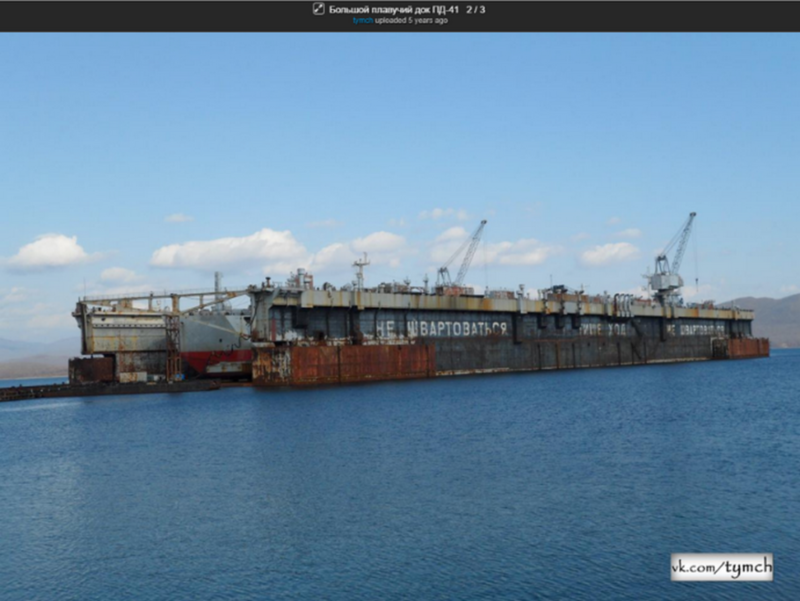 Russia is not the only country with floating dry docks, although there is only one floating dry dock large enough to house Kuznetsov outside Russia. However, due to sanctions and logistics, Dock No. 7 at Keppel Verolme Shipyard in Rotterdam, The Netherlands is not a viable option. Russia’s last choice would be to use fixed dry docks outside its borders. A number of countries have dry docks that could accommodate the ship, including China, South Korea, Japan, India, The Philippines, the United States and several countries within the European Union. Unfortunately for Moscow, any option in Asia is farther away than the shipyards near Vladivostok and would incur greater logistical challenges. Separately, the post-Crimea sanctions regime makes more logistically feasible Western options unworkable from a legal standpoint. For example, the STX Europe dry dock in Turku, Finland is the closest major dry dock that could service Kuznetsov. Although Finland is not a NATO member, it is an E.U. member and is sanctioning Russia. Moscow is caught on the horns of a dilemma. Should it cut its losses with the Kuznetsov modernization, or should it pursue potentially problematic options? Regardless of whether or not the PD-50 is salvaged, the accident will delay the modernization of Kuznetsov. It is unclear how much of the remaining work will require the carrier to enter a dry dock and how much can be done at the pier. However, it appears that work on the propulsion system, hull and shafts will require additional use of a dry dock. Moreover, the effect that the loss of the PD-50 will have on the rest of the fleet—including surface combatants and submarines—is less certain. As the largest floating dry dock in Russia, PD-50 has been in near constant use, often servicing multiple vessels at one time. While the Northern Fleet has other dry docks, the modernization of Kirov-class battlecruisers and the submarine fleet may be affected as other facilities in the region will be forced to absorb the increased demand caused by PD-50’s loss. While Moscow has wavered between its ambitions for a prestigious, blue-water fleet and a defensive force of smaller ships, the circumstances of the PD-50 accident may force it to accept that the prospects for Kuznetsov and, by extension, the blue-water fleet are not good. Maybe the Kremlin will take the opportunity to reassess the wisdom of Russia’s misadventures in Ukraine, Syria and elsewhere. More likely, however, the Kremlin will double down on its sunk costs and pursue expensive, time-consuming and problematic options outlined above. The thoughts and opinions expressed in this publication, in addition to any mistakes, are those of the authors and are not necessarily those of the U.S. government or its components.